From 4 to 7 September a series of events took place at ESCP Europe in Berlin. In the frame of the OEI2 project our university hosted the mainly German-speaking EduCamp – an open event, a so-called BarCamp – and offered a full day programme on open education and new ideas to interested educators, researchers and policy-makers with the wonderful input from presenters and facilitators from Europe and beyond. Around 160 people joined over the weekend and approximately 50 individuals attended the international day. The 3,5 days led to several new idea spaces on topics and activities around open education. An upcoming blog post will highlight some of them soon – and contain some pictures of the event. 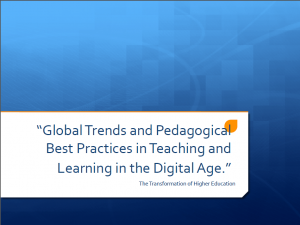 7 September started with a keynote by Marci Powell who warmed up the floor properly with an inspiring presentation on “Global Trends and Pedagogical Best Practices in Teaching and Learning in the Digital Age”. Two OEI2 project partners presented practices of co-creating resources with students and open collaborative course development at their universities. During the pre-event Anne-Christin Tannhäuser (ESCP, project team member) hosted a workshop in German presenting the idea space platform, its main features and concepts behind its development. Participants could try out the platform sharing their own ideas and gave constructive criticism for further improvement of the idea space.